"The slender mother of three alternatively goaded, rallied, calmed and steadied her followers through a long morning of active protest against pupil busing. Thousands of admirers—all of them white, most of them women, and all of them angry—followed Mrs. McCabe by protesting at the schools, chaining themselves to fences, blocking buses and defying arrest." While thousands of parents across the nation raised their voices against “busing,” none received the same level of national attention as Irene McCabe. While McCabe did not have any formal media training, she proved skillful at making her National Action Group’s (NAG) protests into television-friendly events. “She got up on those platforms and you’d think she was born on the stump,” NAG’s lawyer L. Brooks Patterson noted after McCabe’s death in 2004. Born and raised in Pontiac, McCabe claimed to have never traveled south of Detroit before she started protesting busing at the age of thirty-six. Like many other women who became grassroots activists, McCabe, a married mother of three, emphasized her lived experiences as a mother and housewife as the reasons she became involved in politics. McCabe regularly described her and her fellow marchers as “ordinary housewives and mothers,” and explained to a Washington Post reporter, “I’m an amateur. When I address people at rallies, if they can relate to me it’s just because they know I’m the same type of person they are, that I am a housewife…just mainstream, grass-roots America.” Most housewives, of course, were not interviewed in major newspapers and did not regularly appear on the nightly television news. McCabe’s televisual appeal drew on her ability to visibly lead and capably speak for anti-busing parents, while also being able to persuasively present herself as a representative member of this group. More than simply an example of white backlash to civil rights, McCabe learned from other protest movements, creating television-ready scenes that garnered attention and framed her cause in a favorable light. Most notably, McCabe led a 620-mile “mothers' march” from Pontiac to Washington D.C. in support of an anti-busing amendment that was covered on ABC, CBS, and NBC. As historian Nathan Irvin Huggins noted in 1978, television cameras “broadcast the sentiments of the white, Pontiac, Michigan, housewife protesting ‘forced busing’ as earnestly as they had the achievement of Mrs. Rosa Parks in the Montgomery bus boycott.” As Huggins suggests, McCabe successfully leveraged the characteristics of television news—its emphasis on newsworthy events and crisis, its selective use of historical context, its nominal political neutrality, and its emphasis on and production of drama and narrative—to make her case against busing. Among the important strategies McCabe learned from media-savvy civil rights groups was to organize protests as television-friendly events. 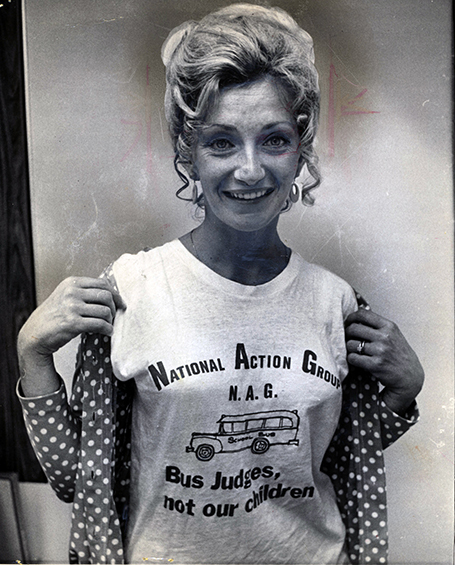 Her most successful and widely reported event was a 620-mile “mothers’ march” from Pontiac to Washington, DC, to support a constitutional amendment prohibiting busing. The specific length of the march was selected to recall the antibusing amendment, House Joint Resolution 620, sponsored by New York congressman Norman Lent. 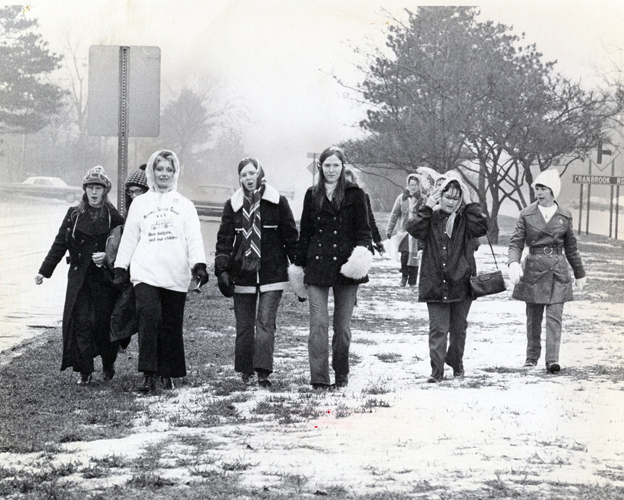 McCabe and five other Pontiac mothers set off on the six-week trek on March 15, 1972, and both print and television reporters noted the event’s historical echoes. 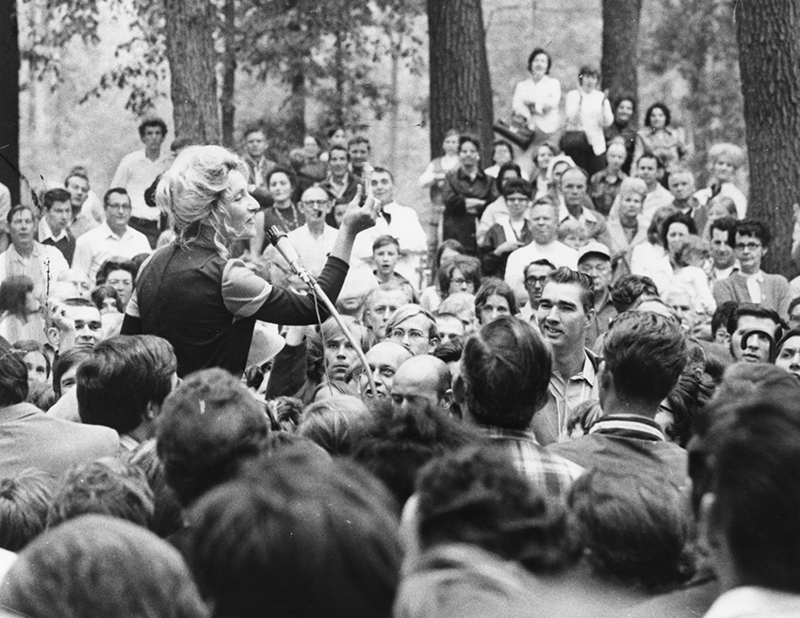 “How and why,” one article asked, “did the trim housewife emerge as a national figure emulating the tactics of the civil rights marchers of the ’60s?” At the Pontiac send-off for McCabe and the marching mothers, ABC’s Jim Kincaid noted, “Irene McCabe and her National Action Group have taken a page from other demonstrations in the past. It won’t be the first walk to Washington, but it may be one of the longest.” In addition to the clear reference to the 1963 March on Washington for Jobs and Freedom, the marchers also made a side trip to Massillon, Ohio, the starting point of Coxey’s Army, a group of unemployed workers who marched on Washington in 1894. 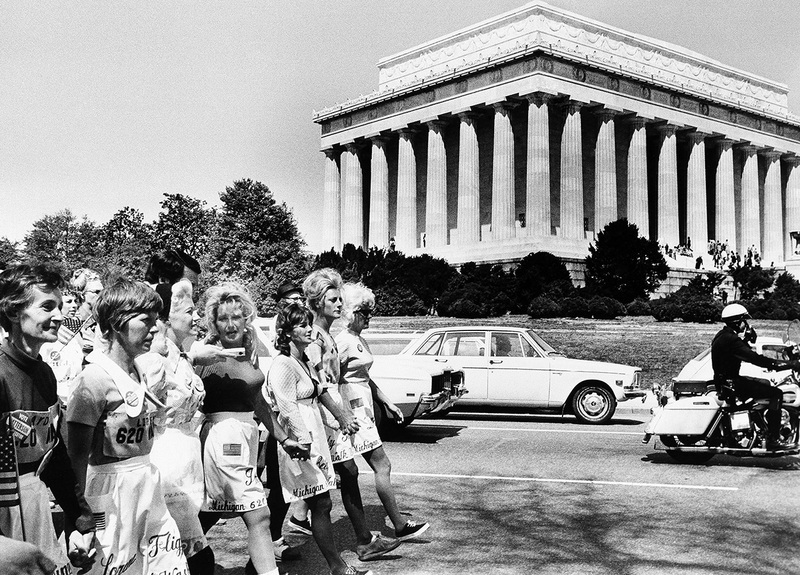 A 1967 Mothers’ March on Washington by welfare rights activists, which did not receive extensive media attention, may also have factored into McCabe’s planning. As these historical precedents suggest, McCabe’s “mothers’ march” was designed to be easily recognized as a newsworthy event. Television and newspaper coverage enabled McCabe and her fellow marchers to claim motherhood as both a private and public identity. Like other antibusing activists, McCabe framed her opposition in terms of her duty as a parent to protect the private spheres of home and family. “I object to the long arm of the federal government reaching into my home and controlling the children I gave birth to,” she told a reporter in West Virginia. At another stop on the march, McCabe remarked, “I would have been an unfit mother if I didn’t try to do something about [my children being bused].” To fulfill her responsibilities as a mother, McCabe argued, she needed to become a “marching mother.” McCabe required media coverage to assume this public identity of motherhood, and in turn the “mothers’ march” cast familiar conventions of women as homemakers and consumers of television in a different light. In their six-week march to Washington, McCabe and the other women traveled hundreds of miles from their children and husbands in Pontiac, and hundreds of miles from the domestic spaces that were central to television conventions for representing family life. McCabe and the Pontiac mothers temporarily left their homes, families, and televisions and emerged via television news broadcasts and newspaper accounts as “marching mothers.” These “mad mamas,” as one newspaper called them, leveraged their public identities as mothers to became television performers rather than domestic consumers of television. Early in the march, McCabe told a newspaper reporter, “This is not my favorite thing—walking, but hopefully people will look along the way at six miserable women on television and write their congressman in favor of the [antibusing] amendment.” As McCabe’s reference to “six miserable women” suggests, the physical pain endured by the marchers was a recurring theme in print coverage of the march. Two weeks into the walk, one marcher had her calves wrapped in bandages, and McCabe noted, “I’m wearing sun glasses to hide the tears.” After particularly hilly terrain in West Virginia, McCabe told a waiting reporter, “When you consider what we’ve been through, it’s amazing. You think your chest is going to pop open, your heart explodes and then there’s another vicious, vicious hill to climb.” A photo of McCabe icing her feet accompanied a story on the marching mothers’ arrival in Maryland. Just a day before reaching Washington, McCabe stopped for medical treatment on her feet. “I simply could not bear the pain any longer,” she said. “It has been this way for almost two weeks. Every step, I don’t know for how many days, has just been agony.” The marching mothers’ misery became as much a part of the story as their opposition to busing, and here again, coverage of the march built on and challenged television conventions. The mothers’ suffering gave the march a narrative emotional quality similar to television soap operas or medical dramas, and like these genres, news accounts encouraged viewers and readers to follow along with the narrative and suffer vicariously with the mothers. The marchers encouraged this view of them suffering on behalf of others. As a sign on the group’s support van declared, “Irene McCabe Is Walking to Washington DC, So Your Children Can Walk to School.” At the same time, the marchers’ visible suffering buttressed their authority as mothers in the public political sphere. A photo taken after marchers reached the nation’s capital, for example, shows McCabe meeting with U.S. senators William Brock of Tennessee and Robert Griffin of Michigan, who had cosponsored an antibusing constitutional amendment. 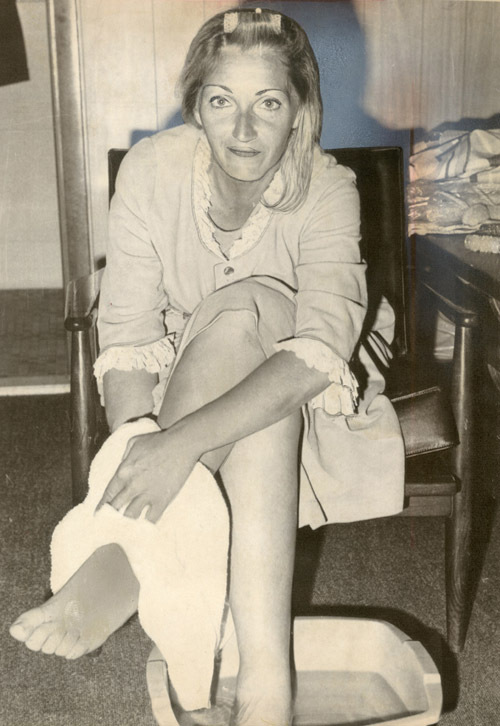 McCabe is seated on a couch in Griffin’s office, with one shoe off and her leg elevated on an ottoman. Unlike the trope of women sitting on sofas watching soaps and suffering vicariously, McCabe and the marchers undertook physical challenges in support of legislation and, thanks to their public suffering, earned an audience with powerful politicians. Television cameras from ABC, CBS, and NBC followed McCabe and the other mothers as they arrived in Washington. The coverage on each station picked up the themes that had circulated in print coverage over the prior six weeks, emphasizing that the marchers were attempting to bring national political attention to the busing issue, that they had endured physical pain during their long walk to Washington, and most importantly, that they undertook the march as mothers. 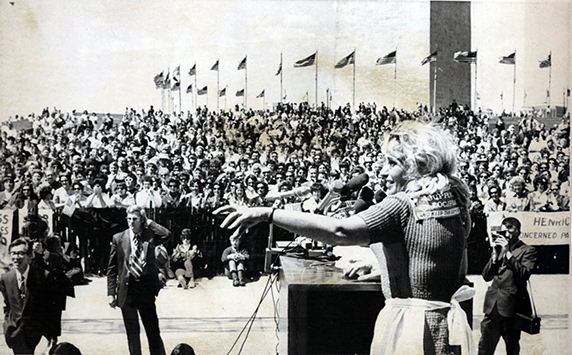 The marchers’ first stop at the steps of the Capitol, where they met with then Michigan congressman Gerald Ford, Tennessee senator William Brock, Massachusetts congresswoman and antibusing leader Louise Day Hicks, and several other prominent politicians, reminded viewers of the political purpose of the mothers’ march. As the mothers walked the final blocks to the antibusing rally on the grounds of the Washington Monument, the television reports segued to focus on how the mothers, especially McCabe, had gamely suffered in support of their cause. Each station mentioned the mothers’ feet and their soreness after miles of walking. CBS cut to a medium shot of three of the mothers’ feet, while reporter Tony Sargent said, “Mrs. McCabe and the others all had foot and leg problems along the way, some requiring doctors’ care.” These scenes made the mothers’ suffering, described in dozens of newspapers stories filed during the march, visible to a national television audience. Not coincidentally, McCabe’s speech at the rally picked up this theme, connecting the physical pain of the march and the pain of childbirth to the building of an antibusing coalition. McCabe limped visibly as she approached the podium, outfitted with several microphones. “I can’t believe we walked the whole way,” she told the crowd. “I personally have suffered a great deal of pain on this walk. It was far more physically grueling than I ever could have imagined. The only time I have ever been in such pain has been in labor. Whenever you’re in labor, you finally give birth to something beautiful. We’ve labored long and we’ve been through a great deal of pain, but it’s worth it, because we have given birth to the rekindling of the government of the people, by the people, and for the people. Look, you’re here!” McCabe claimed the authority to speak based on her status as a mother and her related ability to present a common-sense view on a complex political issue. While McCabe’s rhetoric drew on familiar themes of motherhood and populism, television gave her rallying cries a crucial visual component and broadcast her message on a scale inaccessible to the vast majority of grassroots female activists. At the end of McCabe’s speech, each network followed her cue (“Look, you’re here!”) and cut to the crowd. In those shots, those gathered, almost all white and mostly women, hold clearly worded placards reading, “Stop Forced Busing,” “Pass H.J. Res 620,” and “Welcome Irene.” Behind the crowd, the Washington Monument is visible, ringed by U.S. flags. It is an impressive but misleading sight. While McCabe and the march promoters promised ten thousand people, the Washington Post estimated that only five hundred to eight hundred people attended the antibusing rally. CBS’s Tony Sargent noted drily, “Despite Mrs. McCabe’s dramatic march, today’s turnout was far smaller than expected.” L. Brooks Patterson, NAG’s attorney, expressed his disappointment at the low turnout. “This hillside should have been covered with all your neighbors and friends,” he told the crowd. “They scream the loudest when their children are bused, and they should be here to protest.” In Michigan, many questioned whether the rally accurately represented public opposition to busing. While the Michigan House of Representatives passed a resolution (by a 61–28 vote) honoring McCabe, calling her “the symbol of tens of millions of people who are opposed to forced busing,” the Detroit Urban League was unconvinced. “With the small rally turnout Mrs. McCabe received in Washington, how can the House assume or even support the notion that Mrs. McCabe represents such a large segment of the American population?” asked Detroit Urban League executive director Francis Kornegay. For her part, McCabe expressed frustration with the turnout to the Washington Post: “If I can give up a year of my life (to fight busing) why can’t they turn out for day?” McCabe’s disappointment was no doubt sincere, but it underestimated the march’s success as a media event. The march reportedly cost $7,500 and was paid for by fund-raising in Pontiac and along the parade route. Despite this small budget, it generated daily newspaper reports and television news coverage of the marchers’ departure from Pontiac and their arrival in Washington. Here again, news media, especially television, helped McCabe dramatically scale up her antibusing message. Television news brought McCabe’s rally, which despite a month of advance publicity failed to draw one thousand people, to a national audience of millions of television viewers. By any account, this was an extraordinary return on the time and money McCabe and NAG invested in the march. The mothers’ march reveals both the limitations and promises of television as a tool for political organizing. Television news asks that citizens view certain people, places, and events as newsworthy but does not necessarily lead to particular political outcomes. Television brought McCabe’s message to millions but moved mere hundreds to join the rally in the nation’s capital. Television’s importance to antibusing politics, however, was more significant and more diffuse that this low turnout suggests. Television news was never interested in McCabe in and of herself; rather, she drew the attention of television cameras as the leader of a group that organized television-ready protests focused on a specific issue. When the busing battle died down in Pontiac, television shifted from McCabe to antibusing protests in other cities. Television coverage did not drive massive numbers of people to NAG’s rally in Washington or bring McCabe lasting political power, but it did help thwart busing for school desegregation. In Louisville, Boston, Cleveland, and several other cities, antibusing activists leveraged the characteristics of television news to argue that their rights as parents and homeowners were being violated by activist judges and federal bureaucrats. Likewise, politicians such as Florida governor Claude Kirk, Alabama governor and presidential candidate George Wallace, and President Richard Nixon voiced their opposition to busing in carefully planned events and speeches that played well on television. Support for busing, by contrast, was less organized and less vocal, and when probusing events were organized, like the forty-thousand-person march in support of desegregation in Boston in 1975, they received far less television coverage than antibusing protests. As the antibusing activists who received the most media attention in this era, McCabe and her fellow marching mothers are the most visible example of how grassroots groups and politicians used television to frame the issue of busing for school desegregation.